Nearly 27 million Americans suffer from Osteoarthritis – also known as degenerative joint disease, wear-and-tear arthritis, or degenerative arthritis. To put that in another perspective, half of us will develop knee osteoarthritis in our lives. One in four of us will develop hip osteoarthritis. This condition can affect any joint, but usually occurs in knees, hips, lower back and neck, and small joints in your hands. For most of us, our joints have a coating of firm, rubbery material covering the end of each bone in our joints – this material is called cartilage, and it provides a cushion between bones allowing for a smooth surface for motion. With osteoarthritis, this cartilage breaks down, causing pain, swelling and problems moving the joint. As osteoarthritis worsens, the bones may break down and develop spurs. After a while, inflammation around the joint, which can further damage the cartilage. In the final stages of osteoarthritis, the cartilage can wear away altogether, allowing the bones to rub against each other leading to joint damage and increased pain. 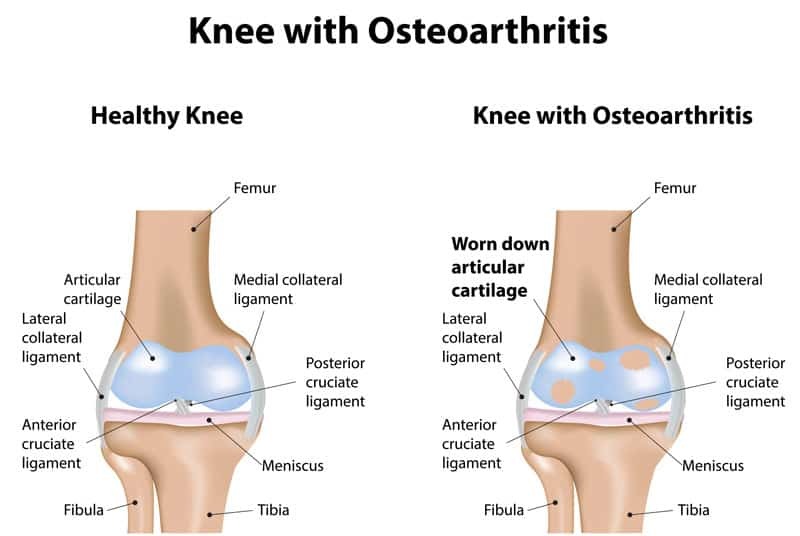 What are Symptoms of Osteoarthritis? 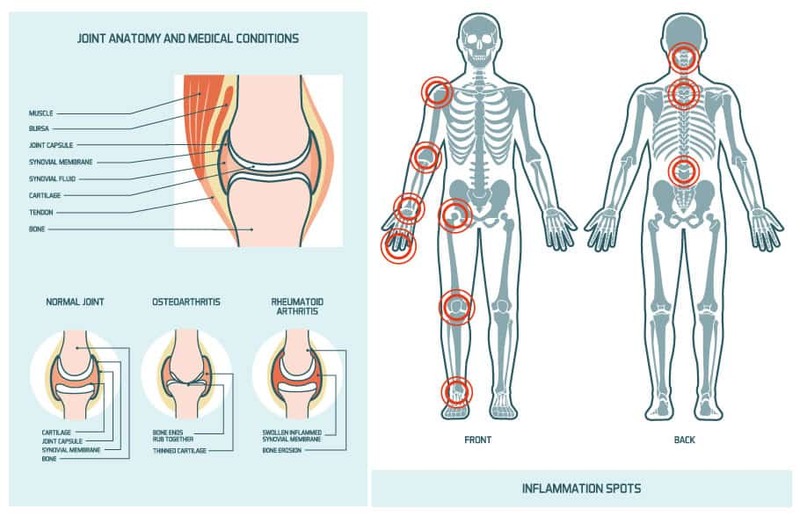 The symptoms and indications of osteoarthritis can vary depending on which joint is affected and how progressed the condition is. Most joints will present with pain and stiffness, especially after sleep or staying still for an extended period. The symptoms of osteoarthritis usually develop over time. Pain that gets worse after activity. Finger osteoarthritis can make fingers swollen, tender and red. There may be pain at the base of the thumb. Hip osteoarthritis can cause pain in the groin area or buttocks and sometimes on the inside of the knee or thigh. Knee osteoarthritis can present with a grating, grinding, or scraping sensation when moving the knee. Feet osteoarthritis can cause pain and tenderness at the base of the big toe. There may also be swelling in ankles or toes. Many spine and joint related conditions share a treatment methodology. Job one in treatment is to relieve any pain you’re experiencing and decrease any reliance on pain medications. Job two is to engage in a wellness program, including stretches and activity to keep your joints mobile and healthy. As a first step your doctor may recommend oral medications to see if they can manage your osteoarthritis pain. These medications include over-the-counter choices such as acetaminophen (Tylenol), ibuprofen (Advil), or naproxen sodium (Aleve). These options may provide temporary relief, but shouldn’t be taken for more than 10 consecutive days without checking with your doctor. If an over-the-counter solution doesn’t give relief, your doctor may prescribe a stronger anti-inflammatory drug to manage the pain. Corticosteroids are powerful anti-inflammatory drugs that are injected directly into the source of the osteoarthritis pain. These injections, combined with an activity or rehabilitation plan, can provide enough relief for you to resume normal activity and help the joint return to a greater range of motion. Hyaluronic acid is normally present in joints and acts as a lubricating fluid. With osteoarthritis of the knee, this fluid can break down. In these cases, injections of hyaluronic acid directly into the knee can provide relief from osteoarthritis. Hyaluronic acid acts like a lubricant and a shock absorber in the joint. After completing a full course of treatment, many patients begin to experience relief with therapeutic benefits lasting as long as 6 months. Once your doctor has helped you reduce your pain and your medication dependence, the next step may be physical therapy or occupational therapy. Physical therapists teach you ways to strengthen muscles and increase flexibility in your joint. Occupational therapists teach you ways to perform regular, daily activities, such as housework, with less pain. In some cases, a brace may provide stability and support for the effected joint. There are two types of braces: “unloader” braces, which take the weight away from the side of the knee affected by arthritis; and “support” braces, which provide support for the entire knee. Alternative therapies, such as topical treatments, acupuncture, or supplements (such as glucosamine and chondroitin) can help diminish the symptoms of osteoarthritis. In some cases, the benefits of these treatments can take 30 days or more to be felt. One thing we’ve seen time after time in our practice at SpineOne is that pain and your mood go hand in hand. So the purpose of all our treatments is to help our patients manage their pain, keep a positive outlook, and get back to a life with greater range of activity and less reliance on pain medication. Osteoarthritis can severely diminish your ability to stay active, and any pain can make it hard to keep a positive attitude. But you have options. See one of our specialists today and learn how to get back to a pain free life.